Trinity's Beachmont porcelain tile covers this outdoor space with style and ease. The mix of color creates a design pattern that's born to stand out, and its ability to be installed indoors and outdoors allowed the pub and grill to create flow from the indoor bar area to their large and in charge deck space. I mean look at that view! Of the floor, obviously. 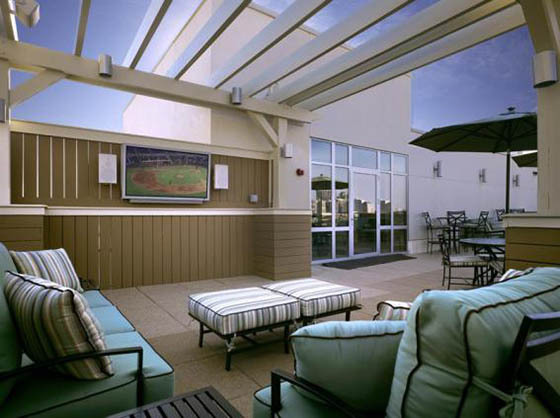 Right in the heart of Philly, 777 South Broad Apartments' rooftop terrace offers breathtaking views of the Philly skyline, deck space for entertaining, grills for barbecuing, and most importantly a Jacuzzi for...jacuzzi-ing. PlayGuard's Carnival tile brings all these spaces together to provide a splash-friendly, bare-feet-welcome rooftop area that every resident can enjoy. The playground at Stony Brook Medical Center allows child psychiatry patients to let loose and forget they're patients. PlayGuard's Carnival and Safari rubber tiles provide thick, strong flooring for extra support and safety, while still being soft enough for kids to kick off their shoes and run wild. Talk about making an entrance! Streetsense charged Surface Architectural Supply to create a custom door worthy of welcoming all their new patrons. Hitting the nail on the head, Surface Supply constructed the entrance using reclaimed nally oak. Carrying the rustic aesthetic through the restaurant, Surface constructed Tazza’s tables from reclaimed white pine, and utilized reclaimed old pine for the restaurant’s wall paneling. Indoor outdoor handcrafted woodworking – vavavoom Surface Supply! In the concrete jungle, abundant outdoor space for kids to play at recess is particularly hard to come by. The Dalton School took that challenge head on and made their rooftop the perfect space for kids to learn and play. PlayGuard's Carnival creates a cement floor look without that cement floor feel. The rubber tiles provide a soft surface for kids to get crazy before getting back to that First grade grind. No cement = No scratches on knees. No scratches on knees = happy teachers/parents. This concrete jungle has met it’s match! Aside from the amazing summer fun that's bursting from this photo, this space stands as one of our most inspirational projects. The Madison Square Park playground was dedicated to NYPD Officer Moira Ann Smith, the only female officer who gave her life on September 11th, 2001. Officer Smith served as a member of the 13th Precinct, making her one of many officers responsible for the safety of this park and its surrounding neighborhoods. The park includes several play areas, including a tire swing set, chalking areas, and sprinkler areas for some serious water fun in the sun. PlayGuard was installed throughout the jungle gym areas to provide a soft yet durable rubber surface that's Mom approved. Want to know more about these products? Check out more Trinity Tile, Surface Supply, and PlayGuard projects. We can't fit all that inspiration into one blog post.